What is the ‘value’ of handmade? However, I disagree that these are good enough reasons. Go and wander through top-end shops and you will find products that match all of these criteria. I think that the main motivation that people buy handmade goods is for the story. But be careful because you can find a story in exclusive boutiques too. You can go shopping with a friend and talk about how elegantly the items are layed out, what the packaging is like, how you decided on your purchase…that is a story too. However, what is the ‘value’ behind the story? This is where I feel handmade wins hands-down. When you decide to buy handmade you are a part of the whole story and not just a consumer, a number on a sales chart. 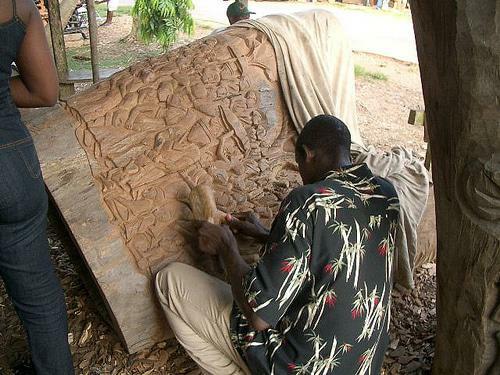 For example: You walk along the street and you see a man carving a wooden sculpture. You stop and watch him in amazement. You see that in front of him are a few pieces for sale. You buy one of these. Why? Because when you get back home you have a story that is more precious to you than anything you could ‘buy’: you met the man himself, you saw him carve, you have an experience and this sculpture, the one you bought, reminds you of this precious moment. That is why you buy handmade. You know the maker and the story behind your product. You know where it came from and you were a part of that. Your story does not begin after you have purchased the product. The story of handmade has value. This entry was posted in Blog and tagged Handmade, handmade goods, pricing, product, shopping experience, skills, story, traditional skills, value of handmade, why you buy, wood carver. Funny enough we had the same discussion – in a small group as part of the conversation at the Biscuit Mill on Saturday. Very interesting! It is cool! so much! Yes,thatÂ´s a great and true post,Wendren and I agree full with you. But unfortunately donÂ´t like pay the most peoples not the higher prices for handmade things.ThatÂ´s here so. They see only the price and not the work and love which in every handmade thing. I know how many time is in every handmade thing. It’s funny, I’d never thought about it that way but it’s so true. Usually handmade is delightful for me because the most beautiful things I’ve seen have been handmade (and I also love the fact that they’re unique), but recently I comissioned a piece of design work and the whole process of working with the designer, getting to know the person, has been a lovely experience. I am so happy to have ran across your post,this is a great reminder of why we as artisans continue to create,and enjoy what we do,every piece does have a story,and alot of hours involved from start to finish no matter what your craft might be.There does seem to be a change taking place where people are looking for unique,handmade one-of-a kind work.Let us hope the change continues..
How true! Only recently have I started thinking about and consuming handmade goods, which includes hand making things for me and my family. I have also recently started baking and cooking from scratch and not buying ready made goods. Not only does it taste better, it is better for us and is a learning process and a skill I will have for the rest of my life. I really do love being a part of a story and supporting those whose hearts are in the right place. Handmade is not for everyone, but those who choose handmade goods will appreciate the value they bring to their lives and love and cherish them, no matter how much they cost because they understand the time and effort required to create something from the heart. Very well put! I love giving away handmade gifts because half the time there’s some kind of story behind it! Whether it be something as simple as the fabric representing the taste/style of the person i’m giving it to or a much larger story!